The local world is increasingly viewing the landscape as an engine for its development and a way to boost the level of citizens’ self-esteem, identity and quality of life. The importance of the local world in managing the landscape is precisely one of the pillars of the Landscape’s new roadmap, “Catpaisatge2020: Country, Landscape, Future”. Today, we are facing a paradigm shift that requires new forms of local governance and forces us to reflect on the relevance and validity of some instruments and strategies upon which landscape policies on this scale have been based. This is the context in which new initiatives led by local authorities or civil society have arisen, initiatives that demonstrate a commitment to landscape quality. Thus, the aim of this seminar is to learn more about and share some of the most interesting experiences in the field of landscape on the local scale in Catalonia and in Europe. With the collaboration of: Government of Andorra and Olot City Hall. Office of Arts and Culture. Please see the Seminar program for more details on registration and payment. . Registration: By the e-mail: observatori@catpaisatge.net. Please fill in your full name, occupation or current job and phone number. Registration fee: 50 EUR (25 EUR for students and unemployed). Languages: Presentations will be given in the language stated in this program. No simultaneous interpreting services will be provided. Laurie Olin: What Is Real? In honor of a lifetime of achievement in landscape architecture and in celebration of Founder’s Day and Thomas Jefferson’s birthday, the University of Virginia awarded Laurie Olin, FASLA, founding principal of OLIN Studio, its Thomas Jefferson Foundation Medal in Architecture. Since the award was first given to Mies van der Rohe in 1966, only a handful of landscape architects have received the medal, including Lawrence Halprin, Ian McHarg, Dan Kiley, and Peter Walker, FASLA. Olin now joins a prestigious crew who have shaped landscape architecture by designing innovative and memorable landscapes around the world. 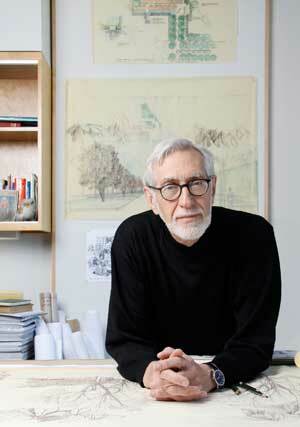 (This is a great time for him: Olin will also receive the National Medal of Arts from President Obama next week).